This research aimed to find out the effectiveness of Flipped Classroom model to self efficacy and student concept mastery. This Research was conducted at SMAN in Bandar Lampung. The sample of this research was 22 students of X MIA1 as an experimental class and 21 students of X MIA2 as a control class. The research design used was Pretest-Posttest Control Group Design. Based on the result of self efficacy ANCOVA test with Fcount>Ftable (15,28>4,09) and the result of concept mastery with Fcount>Ftable (15,49>4,09), it can be stated that there are differences in mean of self efficacy and mastery of student concepts in the experimental class and control class which means that Flipped Classroom gives a significant impact to the self efficacy and student concept mastery. The conclusion of this research is Flipped Classroom learning model can improve self efficacy and ability to master student concept, this is indicated by the average difference of N-Gain self efficacy in experimental class 0.75 with high category and N-gain mastery of concept in experimental class 0,70 with high category. Apriyanti, Y., Nyeneng, I., & Suana, W. Pengembangan Perangkat Pembelajaran Flipped Classroom Pada Materi Getaran Harmonis. Jurnal Pembelajaran Fisika Universitas Lampung, 5(2): 69-79. Bandura, A. (1997). Self-Efficacy The Exercise of Control. Colombia: W.H Freeman and Company. Erniwati, R. Eso, & Sitti Rahmia. (2014). Penggunaan Media Praktikum Berbasis Video Dalam Pembelajaran IPA Fisika Untuk Meningkatkan Hasil Belajar Siswa Pada Materi Pokok Suhu dan Perubahannya. 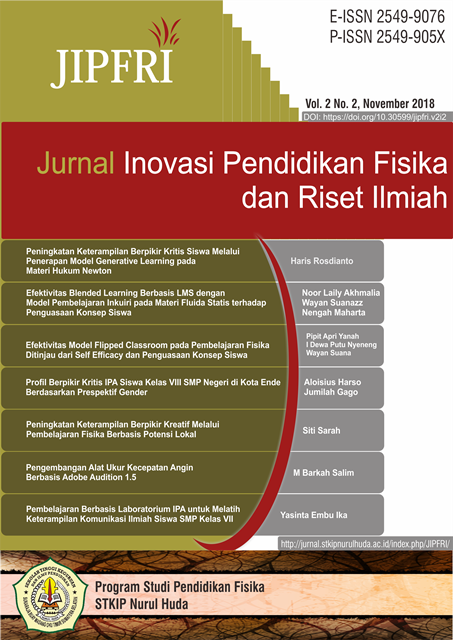 Jurnal Sains Dan Pendidikan Fisika, 10(3): 269-273. McCarthy, J. (2016). Reflections On A Flipped Classroom In First Year Higher Education. Issues in Educational Research, 26(2): 332-350. Rahmadi, D., Nyeneng, I D. P., & Undang, R. (2014). Pengembangan Paket Pembelajaran Sains Bermuatan Nilai Ketuhanan dan Kecintaan Terhadap Lingkungan. Jurnal Pembelajaran Fisika, 2(6): 51-63. Rayandra, A. (2012). Kreatif Mengembangkan Media Pembelajaran. Jakarta: Referensi Jakarta. Rokhaniyah, H. (2017). Flipped Classroom: Can It Optimize Students’ Ability To Find Out Main Ideas In Listening Comprehension?. Jurnal Pendidikan, 8(2): 179-182. Sungkawan, R., Motlan. (2013). Analisis Penguasaan Konsep Awal Fisika Pada Pembelajaran Menggunakan Model Advance Organizer Berbasis Eksperimen Terhadap Hasil Belajar Fisika. Jurnal Pendidikan Fisika, 2(2):73-80. Sihaloho, Y. E. M., Suana, W., & Suyatna, A. (2017). Pengembangan Perangkat Pembelajaran Flipped Classroom pada Materi Impuls dan Momentum. EduMatSains, 2(1), 55-71.